Online educational marketplaces are on the rise, with tools like Udemy and Khan Academy allowing people of all ages to become an expert in any topic. New company Coursera is targeting higher education by offering university-level courses from top institutions to students all over the world, all for free. 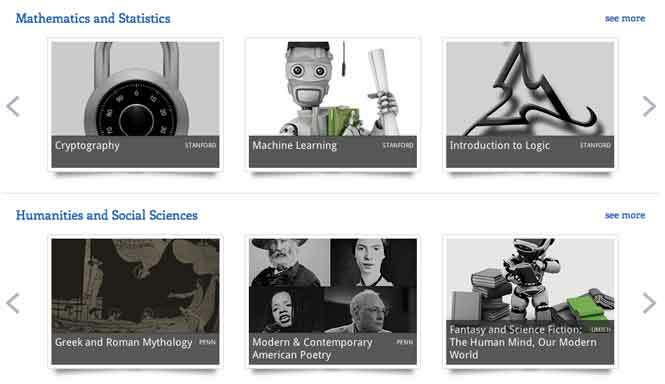 Coursera will offer over 30 courses from its partner schools across a variety of disciplines, including computer science, sociology, medicine, and math. Classes typically last for five to ten weeks, and during that time students commit to watching the lectures, and completing interactive quizzes and assignments, which are auto-graded or graded by peers. Upon completion, the student receives a statement of accomplishment, a letter from the professor, and a score, but the course doesn’t count for any actual credit with that specific institution. The site also features a Q&A forum where students can ask questions about the course material and get answers from fellow students.